The installation is a collaboration between the Office of Facilities and Environmental Quality’s Office of Space and Building Management and Office of Sustainable Energy and Environmental Programs (OSEEP). The solar panels are an important but small step toward utilizing renewable energy. The Department has launched several additional initiatives to promote new energy-related initiatives. 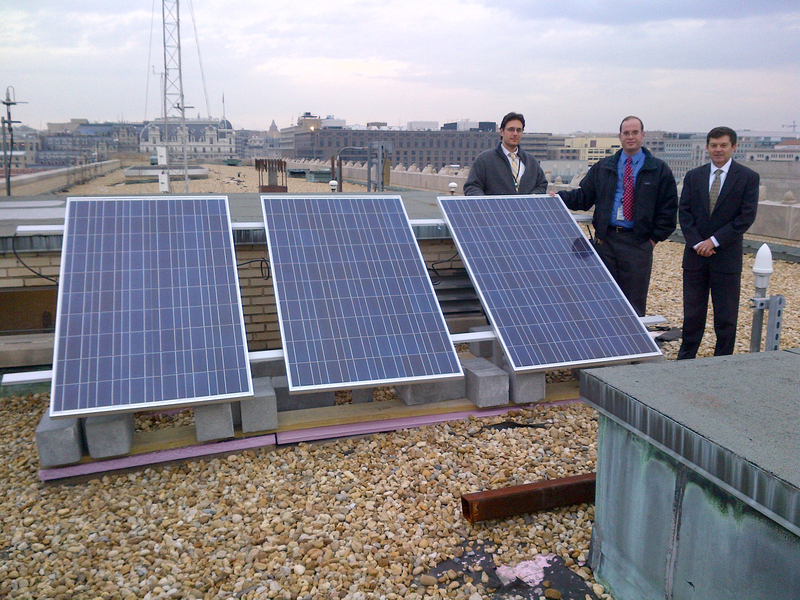 For example, Commerce established a Green Grants program in October 2012 to provide 50 percent cost matching funds for renewable energy and energy efficiency projects Department-wide. The program is managed by OSEEP through a panel of bureau representatives to ensure equity in the project selection process. OSEEP is also heading up a team effort involving the Census Bureau, NIST, and NOAA to use an alternatively financed contract to implement several renewable energy and energy efficiency projects at multiple facilities. For more information on renewable energy or the Green Grants program, visit OSEEP at: http://www.osec.doc.gov/ofeq/OSEEP/. Submitted on December 18, 2013 - 7:08pm. Great job HCHB. This is really a huge step in helping to lessen the barriers that limit the installation of PV within the National Capital Region. Submitted on December 20, 2013 - 7:44pm. Why only 3 panels? What will this really power, a couple lights? The roof looks like it can fit quite a bit more panels. Set a good example and fill the roof with clean energy producing solar. Submitted on March 10, 2014 - 3:13am. Great job HCHB that is something good to contribute thumbs up! Solar panels have long term durability that can last for many years. Even so, it doesn’t gets torn most especially when revealed to extreme weather conditions. The photovoltaic modules have been made to work extremely despite the cold temperature and works efficiently on a hot day.